Authors: Gerald F. Combs, Jr. 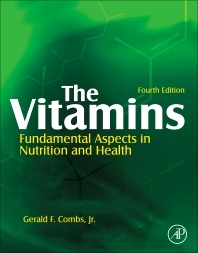 The fourth edition of this bestselling text will again provide the latest coverage of the biochemistry and physiology of vitamins and vitamin-like substances. Extensively revised and expanded on the basis of recent research findings with enlarged coverage of health effects of vitamin-like factors, it is ideally suited for students and an important reference for anyone interested in nutrition, food science, animal science or endocrinology. It contains a cohesive and well-organized presentation of each of the vitamins, as well as the history of their discoveries and current information about their roles in nutrition and health. 1 Is the List of Vitamins Complete?